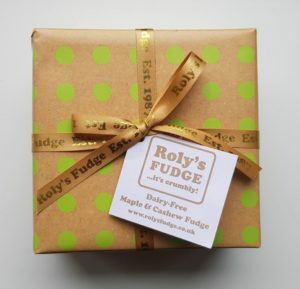 After the amazing response from the dairy-free vegan fudge flavours we introduced to Roly’s Fudge last year; Maple & Cashew and Salted Maple & Pecan, our talented fudge makers have carefully crafted a divine Chocolate Orange Fudge! Roly’s Fudge is famous for its crumbly, melt-in-the-mouth fudge and this dairy-free vegan Chocolate Orange fudge is no exception! The base of our dairy-free vegan fudge flavours consists of organic soya milk, organic coconut oil and the finest cashew butter. To bring you this delicious Chocolate Orange Fudge we sourced the highest quality of cocoa for richness, Valencian orange extract for those zesty notes and specially formulated dairy-free chocolate that provides a warm chocolatey taste that you’d be hard pressed to tell the difference from our standard dairy fudge flavours! 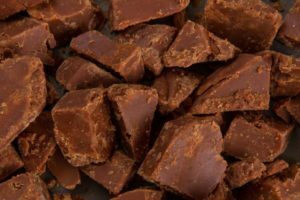 From the careful selection of ingredients, to the passion in developing our recipes, this Roly’s Fudge has also won a “Commended” award by Taste of the West 2019, having been released only in March! Joining our dairy-free vegan Maple and Cashew fudge which also won a “Commended” award at Taste of the West 2018 and our Salted Maple & Pecan which was awarded Gold! The dairy-free vegan Chocolate Orange Fudge has been fully accredited by the Vegan Society, just like all our dairy-free flavours. We are extremely proud to have been accredited as it involved meticulous sourcing of ingredients. We made sure to not only source the best quality ingredients for our Chocolate Orange Fudge, but we also made sure they were all vegan friendly, from the sugar to even looking into whether monkeys were used to harvest the coconuts in our organic coconut oil! You cannot mistake our Dairy-Free Chocolate Orange Fudge thanks to our different range of packaging for our dairy-free vegan fudge flavours, which proudly display the accreditation and have Vegan Society stickers on them. You can now get your hands on some of our amazing dairy-free vegan Chocolate Orange Fudge online here and it has been made by our Roly’s Fudge Pantries in Tenby, Chester, Lincoln, Camden and Salisbury. 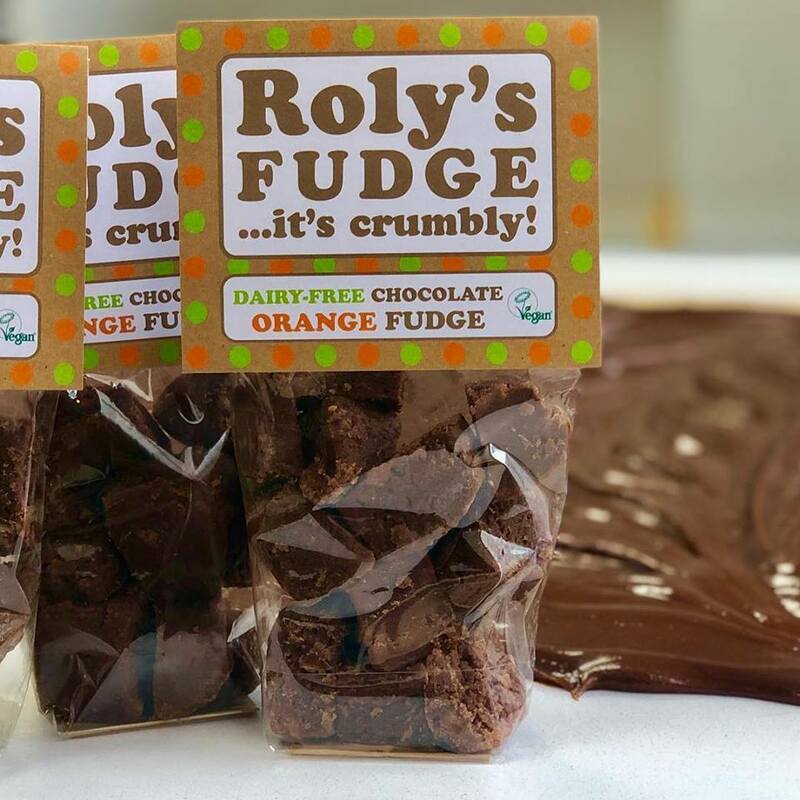 Dairy-free Chocolate Orange Fudge is being introduced to Roly’s Fudge Pantries across the country subject to availability, please call ahead of your visit to see if they are making the vegan Chocolate Orange or if the other two flavours are available instead. Don’t forget to follow us on facebook and instagram to be the first to know when it is being made in a Roly’s Fudge Pantry near you!